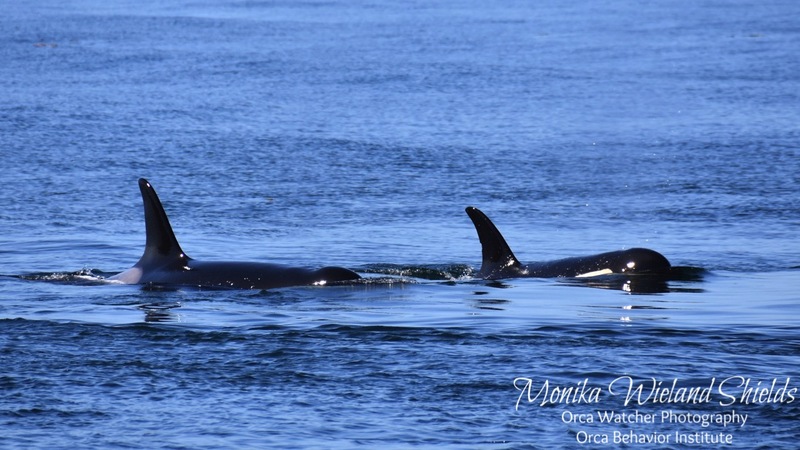 J35 Tahlequah and her son J47 Notch on July 15, a little over a week before Tahlequah gave birth to a calf that lived for less than an hour. That was the message from a friend accompanying the news that J- and K-Pods had returned to inland waters on the morning of July 24th. Bizarrely, the confirmation of this tragic news didn’t come from the Center for Whale Research directly, but from a news reporter who made a Facebook post stating a new calf was seen alive with J35 Tahlequah for less than an hour before dying. I’m sitting on the rocks at Lime Kiln watching members of J- and K-Pods go both north and south when the news hits, and my phone starts buzzing with notifications in my backpack. It’s almost not surprising anymore for this population that can’t seem to catch a break. This year it seems every time they return to inland waters after an absence there is another hit to take. L92 Crewser is deceased. J50 Scarlet is emaciated. Now J35 has lost a baby. We’re coming up on three years without a successful birth into this critically endangered population. The last calf born that is still alive is L123 Lazuli, first seen near the end of 2015. 2015 was a baby boom year, but only five of the eleven known calves born in that 13-month period are still alive. Prior to that, it had been another 2+ years without any successful births. He and many others have been sounding the emergency alarm on this population since their endangered listing more than a decade ago, but what have we really done to give them a shot at recovery? A lot of important research has been done. I understood the need for NOAA to gather the data about many things we already knew about the whales, such as where they travel when they’re not in the Salish Sea and just how much salmon they are eating and from where. The abundant scientific data wasn’t there, and that data would be needed to defend the endangered listing of the Southern Residents in court and advocate for the hard line actions they need to recover. But at this point it’s hard not to agree that we are studying these whales to death. Thirteen years after their endangered listing and their population has declined further to a 30 year low. We know better than ever where they roam yet their critical habitat has not been expanded. We know better than ever what they eat and yet salmon numbers continue to decline. The latest claim, in what is perhaps a veiled effort to derail controversial efforts that are gaining momentum such as breaching the four lower Snake River dams, is that no one action and no one salmon run is going to recover these whales. Okay, fine. So what action is going to recover these whales? If you’ve got an idea of something we can do that will recover Chinook salmon abundance coast-wide like these whales need, we are all ears. But until that happens, I say we do the drastic, big ticket items now that will dramatically improve Chinook runs on certain rivers. Breach those damn dams already. But no, we have to form a committee to talk about it some more. I haven’t yet given up hope on the Governor’s Task Force because for the first time it is bringing all the right interest groups to the table with a clear mandate, a short time line, and buy-in from at least the state level government. But when the main action items you’re hearing about are culling seals, further limiting fishing, and keeping whale watch boats even further away, it does not inspire confidence that the discussion has truly changed at all. Meanwhile: let’s collect more data! I realize my cynicism on this front is a bit hypocritical, since I’m a researcher collecting data on these whales, too. The science-trained part of me knows that policy decisions should be based on science. That’s why we assembled public sightings records to show how much less the Southern Residents are using the Salish Sea, to try and add more weight to the push for an expanded critical habitat designation. But part of my appreciation for these whales has always transcended science, and for that part of me, a new line is emerging for where we have no right to conduct more studies and collect more data and intrude on what is sacred to and for and about these whales. I started to realize where this line was when a research team went out to collect a breath sample from J50, who has been obviously ill for over a month. It was an action that garnered much popular support, because the hope from many is that we might find out what is wrong with her and intervene to bring her back to health. I think playing God in this way is a slippery and dangerous slope regardless; this is a young whale who likely experienced a difficult birth and has not been growing normally, being very small for her age. Will we medically support her her entire life? And what if our intervention makes it worse, and the stress kills her? Who are we to say that now, this whale, is the one we will try to save? Where was our human hand of God when L95 Nigel was killed by a satellite tag? Where was it when J28 Polaris slowly died before our eyes, followed by her son J54 Dipper? We see tragedy after tragedy unfold and nothing is enough for us to act and do anything to fix the underlying symptoms of this ailing population. I don’t think we have the right to try and put a band-aid on the painful experience of watching J50 wilt away so we have something positive to say about our actions. We have not given her a world in which to thrive: why should we feel okay about that? I completely respect the research team that was on the water, as well as their motivations and care for these whales. But it did not sit well with me to see the J16s approached to get the breath sample. J50 Scarlet along with her mother J16 Slick and sister J42 Echo has been spread out and foraging for over half an hour. As soon as the boat approached, the whales took up flanking position, with mom and sister on either side of the Scarlet, and started steadily traveling. I am willing to go on record and say I don’t believe the whales usually react to boats, but to me this felt like whales who didn’t want to be approached. Another researcher agreed that the J16s have been mostly unapproachable on the water recently. What do we need that breath sample for? We know she’s sick. We know she’s likely going to die. Is knowing what particular strain of whatever disease is killing her going to suddenly spur us to action? I doubt it, so let’s just leave her and her family alone. The line I don’t feel comfortable crossing got even clearer to me with the death of J35’s calf. Many members of the whale community started saying that they hoped we would recover the body, to learn more about why it died. Again, I ask: does it matter? We know from the last decade of study that up to 70% of the pregnancies in this population are failing, many of them late in the pregnancy or shortly after birth. We know that nutritional stress in the form of not enough Chinook salmon is a serious contributor to this problem, worsened by the toxic load these whales are carrying and passing along to their offspring. What will taking this precious little body that should have been a hope for the future and cutting it up in the lab teach us that we don’t already know? 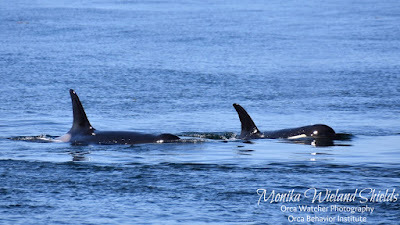 As I write this it has been more than 24 hours since the newborn died, and J35 is still carrying the carcass with her. Let me say that again: a grieving mother has been carrying the dead body of her child for more than a day. After what we have done to these whales, we have no right to take and study that body. Perhaps my words sound harsh. Maybe they should be, because I’m angry. Enough is enough. I fell in love with these whales at a young age because of their innate charisma, their often playful personalities, their amazing life histories. I study them and write about them and share photographs of them out of that love, but also out of a sense of duty to protect what I love; I don’t know what else to do, or how else to do it. But this population is clearly at a breaking point, and the outlook does not look good. The governments on either side of the border have taken no actions of the magnitude needed, and it doesn’t look likely that they will. The Endangered Species Act is already failing to adequately protect these whales and it is under attack to be severely weakened. I pin my hope upon the task force because I have to, because I will not give up. Surely these passionate people can come together in the midnight hour and do what needs to be done, even if it is ten years too late. As I think of Tahlequah out there carrying another dead whale, I cannot express the heartbreak that I feel. Please, whoever is listening, do what needs to be done. I will witness whatever plays out, because I owe the whales that. But I don’t know how or if we would survive counting these whales to zero.